As announced yesterday, the coder Total_Noob issuing a new patch that makes it compatible PSPstates Experiment, created by Dark_Alex plugin that allows you to use the function “savestate” PSP Slim & Lite, with the latest Custom Firmware 5.50GEN. – Do not use this plugin with UMD included. The mode is only savestate with commercial games. – For each key corresponding slot of a rescue. The size of the rescue, varies from game to game (on average 10 to 20mb, reaching a maximum of 36 mb), make sure you always have free space available, because the plugin has no control in ms. 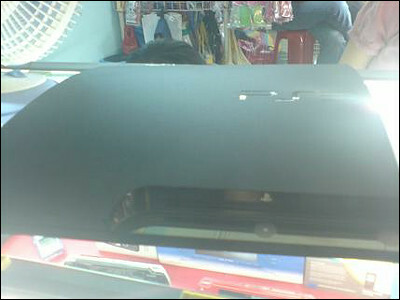 The PS3 Slim is, apparently, selling on the streets of the Philippines at a local underground street vender. They just got in the fabled Ps3 Slim and are selling it to happy buyers. Whether this is real or not, probably a very solid fake, it still looks too well done to be completely fake with all the reports of the PS3 Slim surfacing lately. There have been reports of Sony shipping the Slim as early as July, so perhaps this “fell off the truck” and found itself on the underground market. – It has a 120GB HDD. – The ‘touch’ button for eject and on seems to be gone, and there are now these random buttons. – The ps icon is now white instead of colored. – PLAYSTATION 3 is gone, rather its PS3. It says this on the bottom as well for some reason. – The guy was selling it with a Dualshock 3. Whether it is compatible is another matter. Here’s a video for more “proof”.